Our new research report highlights the key global aspects impacting revenue growth of the global stair lifts market, which is intended to help readers get a clear picture of the stair lifts market and its performance in different regions. Our team of expert analysts have researched the market extensively to obtain in-depth information on the global stair lifts market. The information is gathered from various trusted sources and presented in a systematic format after a thorough validation process. The report consists of all the drivers that are fueling market revenue growth, trends that are governing the market and also the restraints that are limiting the market growth. This comprehensive research can help all the businesses in the industry to understand the market statistics and dynamics that can help them form an efficient market strategy. We have followed an organized structure for the research report on stair lifts. The report begins with the basic definition of the market that forms a base for the readers to get a strong understanding of the market. It also includes a summary of the overall market research and key takeaways like global market share, key dynamics and forecast estimations of the market. This is followed the market segmentation where the market is divided into different segments that simplifies the market study and understanding for the readers. It also includes an individual analysis of all the segments, highlighting the most lucrative one in the market. Another major section of the report features the competitive scenario of the market, which presents brief profiles of the key players operating in the market, depicting their current developments and future strategies. We have worked on the research report with an aim to gather all the information a reader would want to know about the global stair lifts market, with the required details that seek to address all questions and queries a reader may have regarding this market. The report includes key insights gathered with the help of expert interviews, which provides the necessary information that adds great value to the report. The research report is also made keeping in mind those businesses that are already established in the industry or have just entered this market and want to compete efficiently. A wide variety of stair lifts are available in the global market specific to the customer and application requirements. However, these can be categorized on the bases of profile of rail or track. There is also a segmentation of the stair lifts market on the basis of installation location, i.e. commercial spaces and residential spaces. Stair lifts are used for individual or personal purposes and are mostly installed in residential and commercial spaces/public spaces. The residential section involves new stair lifts being installed in all dwelling places. Stair lifts that are installed in commercial spaces involving hospitals, restaurants/hotels, and other public spaces are considered under the commercial segment. 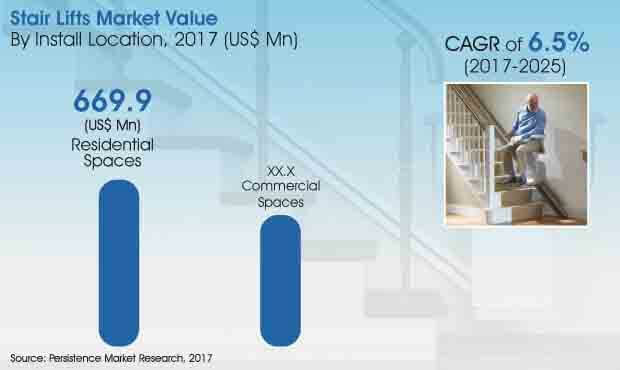 According to the market analysis, the residential spaces segment is estimated to have dominated the global stair lifts market with a valuation of US$ 631.5 Mn in 2017, and is expected to reach a market valuation of over US$ 1,000 Mn by the end of 2025. The commercial spaces segment, though weaker than the residential spaces segment, is expected to emerge as an attractive location for installing stair lifts, given the rising popularity of stair lifts used in commercial spaces. The commercial segment is expected to witness a CAGR of 6.4% during the forecast period. It is being observed that older people mostly prefer stair lifts installed at their residential dwellings. This has increased the installation of stair lifts at residential spaces than at commercial or public spaces. Osteoporosis is a common disease among the older population, resulting in the weakening of bones and reducing bone density, making the elderly population more fragile and prone to bone injury. Patients often observe fractures in vertebrae in the spine, the bones of the forearm and the hip. In regions like the U.S., more than 50 Mn adults have been diagnosed with some type of arthritis. This has resulted in the installation of a large number of stair lifts in the homes of families with elderly people. The market is expected to grow even further with the growing number of medical issues among people. Several public places are expected to experience an increase in the installation of stair lifts in the coming years. This is helped by numerous government and non-government organizations working internationally and at the regional level to provide rehabilitation, care and support for elderly and differently-abled people. These organizations are helping governments build disabled friendly infrastructure, which involves installation of lifts, ramps, automated platforms and other such infrastructure at public places including hospitals, railways stations, schools, etc. Stair lifts are specially designed equipment with high safety features as they are aimed to carry a person with limited abilities. Installation of stair lifts require specialized skills and design calculation according to the staircase and interiors of the dwelling. The carrier (chair/platform) for stair lifts is chosen by the customer based on his/her requirement and feasibility in installation. However, the installation itself is a critical part, which requires handy calculations and design considerations depending on the space availability. This may lead to people being apprehensive about stair lifts and their economic impact. However, this may not affect the commercial use of stair lifts, as projects pertaining to public places typically come with a higher budget and factor in user friendly infrastructure. Symax Lift (China) Co, Ltd.